A fill is a rectangular object that can be placed on any layer. When placed on a signal layer, a fill becomes an area of solid copper that can be used to provide shielding or to carry large currents. Fills of varying size can be combined to cover irregularly shaped areas, and can also be combined with track or arc segments and be connected to a net. Fills can also be placed on non-electrical layers. For example, place a fill on the Keep-Out layer to designate a 'no-go' area for autorouting. Place a fill on a Power Plane, Solder Mask, or Paste Mask layer, to create a void on that layer. In the PCB Library Editor, fills can be used to define component footprints. Click or press Enter to anchor the first corner of the fill. Move the cursor to adjust the size of the fill, then click or press Enter to anchor the diagonally-opposite corner and complete placement of the fill. Continue placing further fills, or right-click or press Esc to exit placement mode. A fill will 'adopt' a net name if the first corner is placed on an object which has a net name. Press the L key to flip the fill to the other side of the board – note that this is only possible prior to anchoring the fill's first corner. Press the Tab key to access an associated properties dialog, from where properties for the fill can be changed on-the-fly. Note that the attributes can be modified during placement, press Tab to bring up the Fill dialog. Changes made will affect the object being placed, and subsequent objects placed during the same editing session. A Fill can be placed as a layer-specific keepout object or an all-layer keepout to act, for example, as a placement or routing barrier. Objects defined as keepouts are ignored during output generation, such as photo plotting and printing. A layer-specific keepout fill is simply a Fill object with its Keepout property enabled, an all-layer keepout is a Fill that has been placed on the Keepout layer. To place a layer-specific keepout either place a standard Fill on the required signal layer and then enable the Keepout property to make it a layer-specific keepout, or use the predefined Fill keepout placement command, available in the sub-menu on the Ribbon at Home | Place | Keepout. To place an all-layer keepout make the Keepout layer the active layer, then place a Fill from the Ribbon (Home | Place | Fill). This method of editing allows you to select a placed fill object directly in the workspace and change its size, shape or location, graphically. Click and drag A to resize the fill in the vertical and horizontal directions simultaneously. Click and drag B to resize the fill in the vertical and horizontal directions separately. Click and drag C to rotate the fill about its center point. Press the Spacebar to rotate the fill anti-clockwise or Shift+Spacebar for clockwise rotation. 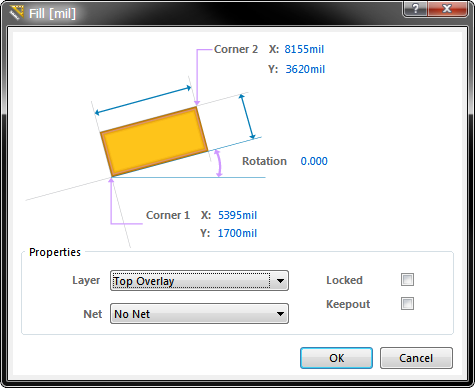 The Rotation Step size is defined on the PCB Editor – General page of the Preferences dialog. Press the X or Y keys to mirror the fill along the X-axis or Y-axis respectively. This method of editing uses the Fill dialog to modify the properties of a fill object.